About The Play Sangeet Ki Katar ~ The Musical is an Hindi adaptation of popular marathi ﬁlm “Katiyar Kaljat Ghusli” which in itself is an adaptation of an original play with the same name, Sangeet Ki Katar ~ The Musical is one of its kind Broadway style presentation produced by Media More Entertainment with more than 80 artists, more than 150 props & sets, over 40 heavily designed costumes, live singing & Music comes together to make one majestical theatre presentation Sangeet ki katar. The Story A clash of two musical families, where in the end, music is the winner. When greed takes the front seat, manipulations shift gears. A race starts a race that kills whatever comes across the way, a race that ultimately ends on the losing side. When it happens to a music maestro, it is only the music that suffers. 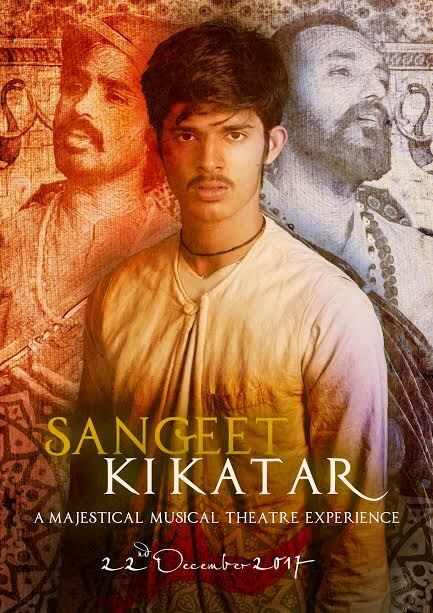 Sangeet Ki Katar depicts the story of the art of music suffering, which is uncannily narrated by a Dagger (Katar). The Music goes live in the play with Actors Singing the Compositions which are a compilation of Indian Classical Music, Songs Originally composed by Pandit. Jitendra Abhisheki & recomposed for the ﬁlm (used in the play) by Shankar - Eshaan - Loy. The Production The Set designs and the production design for the play is done by talented professionals and had a guidance of Sujeet Swant who has done production design for many Bollywood ﬁlms which includes names like Bajirao Mastani. About The Film Marathi ﬁlm “Katiyar Kaljat Ghusli” which in itself is an adaptation of an original play with the same name,is directed by Subhod S Bhave and has Shankar Mahadevan, Sachin Pilgaonkar, Subhod Bhave in lead roles. The Story is written by great marathi writer Purushottam Darwhekar who was an Indian writer and producer of Indian classical and semi-classical musical plays and radio and television programs. He is credited with a revival of the Marathi musical theater in the 1960s,The Screenplay of the ﬁlm is written by prakash kapadia Some of his notable works which he has done as an Writer are Bajirao Mastani (screenplay and dialogue), Saawariya 2005 Black and Devdas etc. The Play is Adapted and Directed By S Venkat Narayana Murthy, a multitalented young enthusiast who started as an actor director of plays and drama in Delhi. There he got a chance to direct and write some of the most exciting dramas, from a genre of comedy to Social awareness plays, Ever since then he never looked back and started practising theatre, and performed more than 90 theatre plays in Delhis public stage or be it Mumbais famous NCPA (National Centre for Performing Arts), and many street plays, and also anchored a show with Topper TV, which is one of the popular educational channels, reporting and taking interview on Sahara One a leading Hindi channel, Theatre has been part of his life from past 10 Years and the journey goes on.